Though few reptiles today are apex predators, many examples of apex reptiles have existed in the past. Reptiles have an extremely diverse evolutionary history that has led to biological successes, such as dinosaurs, pterosaurs, plesiosaurs, mosasaurs, and ichthyosaurs. A series of footprints from the fossil strata of Nova Scotia, dated to 315 million years, show typical reptilian toes and imprints of scales. The tracks are attributed to Hylonomus, the oldest unquestionable reptile known. 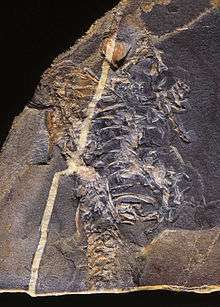 It was a small, lizard-like animal, about 20 to 30 cm (8–12 in) long, with numerous sharp teeth indicating an insectivorous diet. 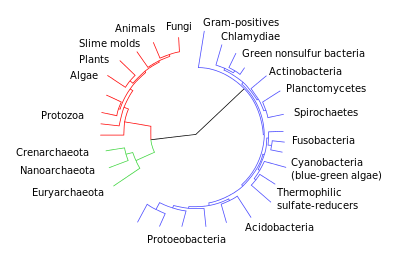 A basic cladogram of the origin of mammals. 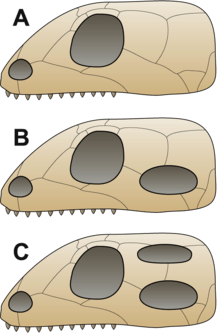 Important developments in the transition from reptile to mammal were the evolution of warm-bloodedness, of molar occlusion, of the three-ossicle middle ear, of hair, and of mammary glands. 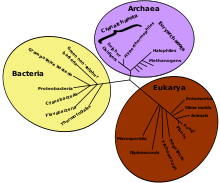 By the end of the Triassic, there were many species that looked like modern mammals and, by the Middle Jurassic, the lineages leading to the three extant mammal groups — the monotremes, the marsupials, and the placentals — had diverged. Near the end of the Carboniferous, while the terrestrial reptiliomorph labyrinthodonts were still present, the synapsids evolved the first fully terrestrial large vertebrates, the pelycosaurs such as Edaphosaurus. 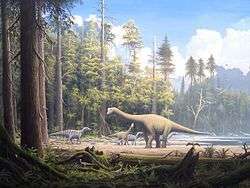 In the mid-Permian period, the climate turned dryer, resulting in a change of fauna: The primitive pelycosaurs were replaced by the more advanced therapsids. ↑ Paton, R. L.; Paton, T. R.; Clack, J. A. (1999). "An amniote-like skeleton from the Early Carboniferous of Scotland". Nature. 398 (6727): 508–513. doi:10.1038/19071. ↑ Falcon-Lang, H.J. ; Benton, M.J.; Stimson, M. (2007). "Ecology of early reptiles inferred from Lower Pennsylvanian trackways". Journal of the Geological Society. 164 (6): 1113–1118. doi:10.1144/0016-76492007-015. ↑ "Earliest Evidence For Reptiles". Sflorg.com. 2007-10-17. Retrieved 2010-03-16. ↑ Palmer, D., ed. (1999). The Marshall Illustrated Encyclopedia of Dinosaurs and Prehistoric Animals. London: Marshall Editions. p. 62. ISBN 1-84028-152-9. ↑ Ruta, M.; Coates, M.I. ; Quicke, D.L.J. (2003). "Early tetrapod relationships revisited" (PDF). Biological Review. 78 (2): 251–345. doi:10.1017/S1464793102006103. PMID 12803423. ↑ Juan C. Cisneros; Ross Damiani; Cesar Schultz; Átila da Rosa; Cibele Schwanke; Leopoldo W. Neto; Pedro L. P. Aurélio (2004). "A procolophonoid reptile with temporal fenestration from the Middle Triassic of Brazil". Proceedings of the Royal Society B: Biological Sciences. 271 (1547): 1541–1546. doi:10.1098/rspb.2004.2748. PMC 1691751 . PMID 15306328. ↑ Linda A. Tsuji; Johannes Müller (2009). "Assembling the history of the Parareptilia: phylogeny, diversification, and a new definition of the clade". Fossil Record. 12 (1): 71–81. doi:10.1002/mmng.200800011. 1 2 Graciela Piñeiro; Jorge Ferigolo; Alejandro Ramos; Michel Laurin (2012). "Cranial morphology of the Early Permian mesosaurid Mesosaurus tenuidens and the evolution of the lower temporal fenestration reassessed". Comptes Rendus Palevol. 11 (5): 379–391. doi:10.1016/j.crpv.2012.02.001. ↑ Van Tuninen, M.; Hadly, E.A. (2004). 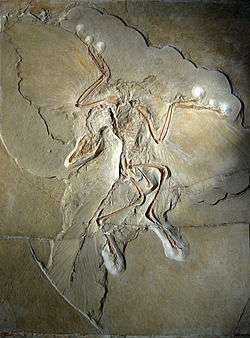 "Error in Estimation of Rate and Time Inferred from the Early Amniote Fossil Record and Avian Molecular Clocks" (PDF). Journal of Mulecular Biology. 59 (2): 267–276. doi:10.1007/s00239-004-2624-9. PMID 15486700. ↑ Rieppel O, DeBraga M; Debraga (1996). "Turtles as diapsid reptiles". Nature. 384 (6608): 453–5. doi:10.1038/384453a0. ↑ Zardoya, R.; Meyer, A. (1998). "Complete mitochondrial genome suggests diapsid affinities of turtles". Proc Natl Acad Sci U S A. 95 (24): 14226–14231. doi:10.1073/pnas.95.24.14226. ISSN 0027-8424. PMC 24355 . PMID 9826682. ↑ Iwabe, N.; Hara, Y.; Kumazawa, Y.; Shibamoto, K.; Saito, Y.; Miyata, T.; Katoh, K. (2004-12-29). "Sister group relationship of turtles to the bird-crocodilian clade revealed by nuclear DNA-coded proteins". Molecular Biology and Evolution. 22 (4): 810–813. doi:10.1093/molbev/msi075. PMID 15625185. Retrieved 2010-12-31. 1 2 3 Colbert, E.H. & Morales, M. (2001): Colbert's Evolution of the Vertebrates: A History of the Backboned Animals Through Time. 4th edition. John Wiley & Sons, Inc, New York — ISBN 978-0-471-38461-8. ↑ Phil Senter (2007). "A new look at the phylogeny of coelurosauria (Dinosauria: Theropoda)". Journal of Systematic Palaeontology. 5 (4): 429–463. doi:10.1017/S1477201907002143. 1 2 "The Reptile Database". Retrieved 1 February 2012. ↑ Hansen, D. M.; Donlan, C. J.; Griffiths, C. J.; Campbell, K. J. (April 2010). "Ecological history and latent conservation potential: large and giant tortoises as a model for taxon substitutions" (PDF). Ecography. Wiley. 33 (2): 272–284. doi:10.1111/j.1600-0587.2010.06305.x. Retrieved 2011-02-26. ↑ Cione, A. L.; Tonni, E. P.; Soibelzon, L. (2003). "The Broken Zig-Zag: Late Cenozoic large mammal and tortoise extinction in South America" (PDF). Rev. Mus. Argentino Cienc. Nat., n.s. 5 (1): 1–19. ISSN 1514-5158. Retrieved 2011-02-06. 1 2 Kumazawa, Yoshinori (2007). "Mitochondrial genomes from major lizard families suggest their phylogenetic relationships and ancient radiations". Gene. 388 (1–2): 19–26. doi:10.1016/j.gene.2006.09.026. PMID 17118581.